It’s the return of the Big Homie Franz to Andy’s Satellite of Love! Before he ships off to Alaska for the better part of the rest of the year, my lanky friend sits down to discuss 1994 RAW, the virtues of Flair versus Hart, and of course, some MMA. Thrill to the best sound quality in the history of the program! 51 down, 49 to go! 1999. The year of The Big Boss Man mocking death. The year of the Mean Street Posse. The year Vince McMahon showed us how you really book a giant. The year Miss Kitty became a woman before our eyes on pay per view. What a year it was. Let us take you on a journey through the days, weeks, and months… here on Let’s Watch Wrestling. Sometimes a man has to answer the call. The call of his employer. The call of his employer to peace out from his home on the day he usually records his podcast. This is that sometime. SO WE WERE TOLD MONDAY EDITION! You wanna know about RAW? TOO BAD! We gave it like five minutes! You wanna know about wrestling you DIDN’T watch from the late ’90s and early 2000s? Great! WE GOT YOU COVERED! And finally, on a Very Special SWWT-WR, Megan comes out. You’ve gotta hear this! Super Heavyweights, dead relatives, and puppies abound at WWF’s Armageddon 1999. Can Andy and Jeff survive 30 minutes of Vincent Kennedy McMahon “wrestling?” Check out episode 5 of Let’s Watch Wrestling to find out! A Stone Cold Swerve, a BIG title win, and a debut of Olympian proportions. It’s WWF Survivor Series 1999 on this edition of Let’s Talk Wrestling, with Andy and Jeff! Ahoy Mateys it’s So We Were Told Wrestling Radio! On this week’s edition buy buy bye(? ), WWE Stock. Extended Discussion of what’s crackin’ in NXT, like, the ladies! NEW LADIES! Amirite? Then we talk about Countdown this past week with Memorable Debuts. #1 sucked, Andy tells us why. All that and more! 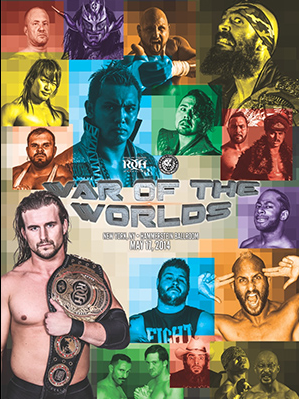 Andy and Jason are joined by fellow Fakepunching Fellowship member Paul to discuss his trip to NYC to see Ring of Honor vs. New Japan: WAR OF THE WORLDS! Find out what it was like for him to meet some of the talent, and how the crowd behaved in the Hammerstein Ballroom! You probably want to hear Megan and I talk about video games for an hour, right? I mean, yeah? Cool. Here it is. Andy’s Satellite of Love, Episode 50! Get out the plunder, daddy! It’s a special Tuesday night edition of So We Were Told Wrestling Radio, if you weeeeeeel. Get funky like a monkey as the crucial crew of Recking Ball, Steele, and Andy serve you up a heaping helping of pro graps news and analysis! Daniel Bryan’s neck, a Raw is Snore that even the Shield could not redeem, HAVING A FOXY DAY, fashion gabbing, and even a little bit of PURORESU. It’s all right here on THE MOTHERSHIP! It’s an all-news week – the Shield aren’t breaking up (!!! ), Lana + Rusev 4ever, Ric Flair is about to be on TV a lot more, Rey might be on TV a little more, lots of wrestlers have podcasts but not all of them are good, and a new season of Tough Enough is in the works! Plus, we welcome a new member to the team, Krystal.